Please don’t throw your coffee at the screen when I tell you I enjoy running. In effort to relieve stress, some people smoke, some drink, some eat, some shop, I run. I picture it as an old steam engine. Every few miles the engine stops and literally lets off excess steam that’s accumulated as the coal burned. I seem to burn a lot of coal in this life and it leaves me with some steam build-up. Running helps me blow off things that are bothering me or gives me a chance to yield in areas I feel the Lord working in. I often ask Him to pound the Julie right out of me as my feet pound the road, and breathe His Spirit into mine instead. One morning, Zach surprised me and woke up at 6:15 to join me. I tried to talk him out of it. It’s too long. It’s too early. You won’t like it. He didn’t listen. He wanted to go with me. Running down that country road side by side with him, I couldn’t wipe the smile off my face. I waved at every passing car and proudly ran beside him. He wanted to be with me. I wonder if that’s a pin-hole glimpse of how Jesus feels when we run beside Him. A year ago when I chose to obey His prompting and wake up early to run, was He smiling? I think of how I “coached” Zach. How I talked about breathing smoothly, and how I mapped out our course. I didn’t tell him everything, just what he needed to know for right then. I gave him areas to go at his own pace. So many times, God has done the same with me. Yep, there outlined on the pavement were our two figures running side by side. I thought back to a sermon I heard a few weeks ago that described discipleship as being a shadow maker. Anyone can cast a shadow if the source of light is in the right place. We don’t have to do anything special. So, the emphasis on being a shadow maker was “What shadow are you casting?” Is the shadow of you, or the cross? Whether we realize it or not, as parents, we cast a shadow. By default that shadow is in the shape of our self or some other worldly, prized possession. 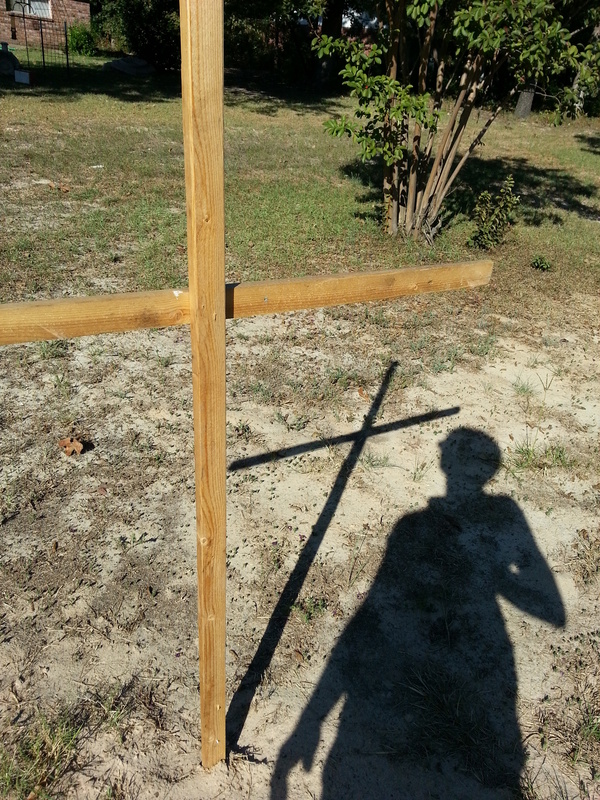 But with intentional effort, that shadow can start to look less like me, and more like an empty cross. For our greatest goal as parents is to show our children Jesus. And that takes faith. Yes, hopefully we can be a good model for them, but we will only be a model. A stand-in. We will fail them in some way because we can never do this parenting, or this life thing perfectly no matter how many books we read. Only one person will never fail our children and that is Jesus Christ. In the shadow of the cross stands one man who loves them more than we do. A man who laid down His life so that we may know Him and have a relationship with Him. So if we are to strive for anything, may we strive to make Jesus great. May we strive to read His Word for our self and to our children and pray that they will know Him, the true source of joy, peace and fulfillment in this life. May we have faith to trust that He ultimately is their parent and knows what is best for them. So whatever you do to blow off some steam, I pray that as that steam fades into the air, the shadow you cast back on the ground will look a whole lot like this. This post is part of a series called #write31days. To see the whole series and catch up, click HERE.